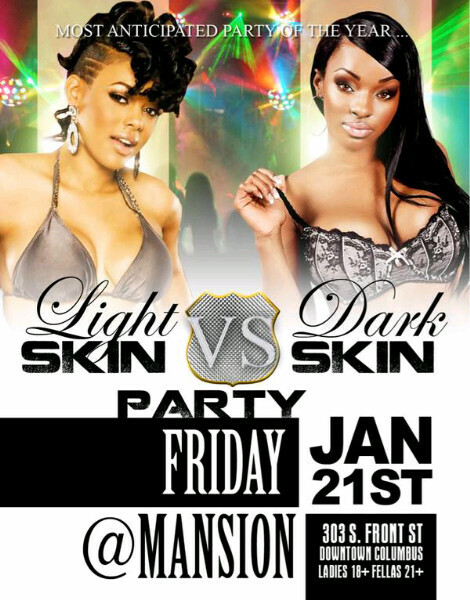 Club promoters in Columbus, OH plan to host a party they are billing as “Light Skin vs. Dark Skin” and have used social media (Twitter and Facebook) to help with the party’s promotion. An electronic version of the party flyer began making its rounds on the popular sites earlier this week and stirred up quite a bit of commotion, as some started claiming alliance to #teamlightskin or #teamdarkskin, while others went about vehemently denouncing the exploitation of the “color battle” for profits. It’s clear that the issue has yet to die. But why not? This is a generation that has become much more progressive in thought, bucking many of the traditionally conservative mores of the black community, particularly those surrounding the ideas of personal sexual practices. Even in those spaces where there is still much disagreement and debate, say regarding homophobia or interracial dating, there is a willingness at least to have a conversation and discuss root causes of the conflict. Colorism remains a taboo topic that is generally swept under the rug. While we mostly agree that the idea is silly, we fail to address the very real ingrained sense of white supremacy that informs our ideas surrounding the various shades that black people come in. So long as we ignore these problems and leave them unsolved, the sore will continue to grow and fester resentment amongst ourselves. Extracts from a thegrio.com article by Mychal Denzel Smith (original). Published 13 January 2011. Why would it matter what shade you are. I don’t understand. To the people who think this is important I’d like to see you cope with real problems like being facialy scarred in fire.